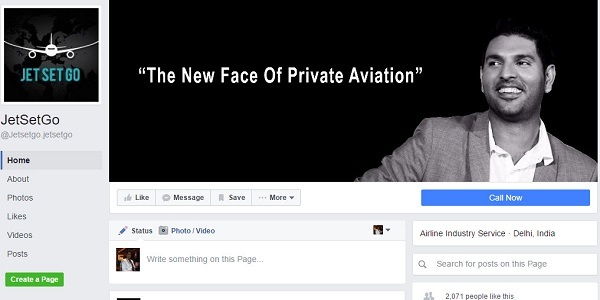 How JetSetGo is becoming UBER of the private aviation industry in India? Hailing from a typical Marwari family, entrepreneurship is in the blood of Kanika Tekriwal. For her, entrepreneurship is all about running a business, solving problems and creating success from scratch. When she was all set to start his startup JetSetGo, his life took a very tragic turn and she got diagnosed for her Cancer. But it could not stop her from pursuing her dream; the 8 months of treatment gave her enough time to idealize her dream of JetSetGo. JetSetGo is an online market place for private jets and helicopters. She founded her dream company JetSetGo in March 2014 after she noticed a very huge gap in the aviation business in India as compared to developed countries. Why we chose JetSetGo as Startup of the Week? JetSetGo is India’s first company to deal with private jet charter service. The company has more than 40 private jets on their fleet. JetSetGo has been growing at a rate of 70% year on year. Its customer range starts with a net worth of $10 million and comprises corporate houses, celebrities and politicians. Since its launch JetSetGo is getting almost 200 bookings per month. The pricing is dynamic and the minimum cost of booking a seat on a private jet is ₹4500. JetSetGo is targeting the top 5% people of India. JetSetGo has on board almost 80% of India’s private jet fleet. According to Kanika Tekriwal, “The cost of chartering a private jet for a birthday party starts at around Rs 60,000 an hour and can even touch Rs 2.5 lakh per hour, depending on the aircraft. We have also organized bachelor parties and pre-wedding photo shoots among other experiences on a private jet”. JetSetGo in December 2015 raised around $2 million from Puneet Dalmia, MD, Dalmia Bharat Ltd. The funding helped the company to grow the company’s ground presence across the top airports and start inter-city private jet shuttles and air ambulance services bookings. Prior to this, in July 2015, YouWeCan, a funding firm from cricketer Yuvraj Singh invested an undisclosed amount for undisclosed stake in the company. “It is great to be associated with India’s first marketplace for private jets and helicopters. JetSetGo has left me impressed with its unique concept and capabilities. I see a lot of potential and aggression in the brand to give its best to the customer bringing much-needed change in the private aviation sector which was long awaited,” said cricketer Yuvraj Singh about the startup. The private aviation industry in India is in a budding stage with only 15% of the total aircraft in India being private jets and helicopters which is very less while comparing with other countries in the world. At present, the industry is highly disorganized and fragmented but at the same time, it is growing at a very rapid pace. The startup is eyeing to capture at least 20% market share by the end of this year. JetSetGo acquires private jets from private jet operators. JetSetGo is set to revolutionize the private aviation business by re-defining the private aviation business in India integrating technology to their online platform. JetSetGo is growing at a rate of 70% YoY. Having a more focused and targeted customer base, the startup focuses more to offer its best service to the customers without any additional charge.